Kenya Nagashima and Neha Jagannath as mother and son. 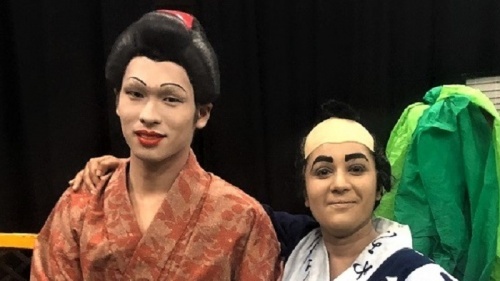 EVER since female actors were banned from the Kabuki stage in 1629, “gender-bending” has been the name of the game in this famous Japanese theatre tradition. But now a happy band of ANU students has been turning convention on its head. The group, Za Kabuki Club, founded in 1976 and supported by the Embassy of Japan, is joyously flouting the rule that says men must play women by adding to it their own tradition – women play men. “CityNews” caught up with a spirited gaggle of students at Theatre 3 as they applied their makeup for a dress rehearsal before this weekend’s annual performance season. This year it’s not the colourful, ferocious face-paint of the grand historical dramas. The two–act play, “Mabuta no Haha” (The Remembered Mother) by Hasegawa Shin, written in 1931, is a modern play in the domestic drama category. Nearby Neha Jagannath, who plays his/her adult son in a play, was practising her manly stances. The backstage crew and cast proved to be a mixed bunch of ANU students of various nationalities, most studying Japanese language but some ranging into pure science and actuarial studies. Most said they had worked their way through the club both on and offstage, but those “CityNews” spoke to agreed that being in a play had helped with intonation, manners and in one case acquisition of the Kanji script. The play, which most viewed as a tragedy (“though not like Shakespeare”) was very different from last year’s choice, “Topnot Bunshichi: A Story of Human Relations”, which featured Aussie-style humour in the surtitles and even further from the grand spectacles of historical Kabuki plays, like “Kanadahon Chushingura”, the bloody story of the “Loyal 47 Ronin”. “The Remembered Mother”, based on the real life story of the playwright, follows the story of orphan Chûtarô, who is in search of his long-lost mother, making forays into the gangster and geisha worlds as the plot reaches its bitter-sweet conclusion – one of three alternative endings to the play. It has a tragic ending, even though he survives, eventually coming to terms with his reality instead of living a fantasy. Za Kabuki club president Waka Okumura personally translated the work into English and told “CityNews” that one of the challenges was to translate phrases from the Edo Period. 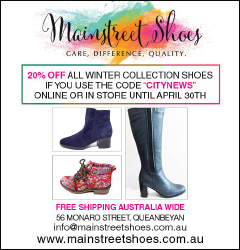 “The language is a special language… there are many words and phrases never heard by ordinary Japanese, so it wasn’t easy to translate… It doesn’t have an Australian flavour,” she said. Okumura said she has no illusions that the great Kabuki acting dynastic families were about to surrender their female roles to women any time soon. It was ironical, she noted, that Japan was also home to the Takarazuka Revue, Japan’s all-female theatre troupe, whose actors cultivated masculine characteristics. 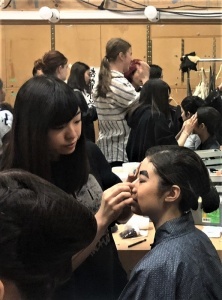 She has been with Za Kabuki for three years while studying for an Asian Studies degree, first working backstage, and has noticed the improvements in the Japanese language skills of the actor-members. “Language is not just about words and grammar,” she said. “The Remembered Mother”, Theatre 3, Repertory Lane, Acton, 6pm, October 5-6, and 1.30pm, October 7. Tickets at the door.